Live Assembly Election Result: Madhya Pradesh, Rajasthan, Telangana, Chhattisgarh, Mizoram: The Congress has emerged victorious won in Madhya Pradesh, Chhattisgarh and Rajasthan, dealing a severe blow to the BJP just a few months ahead of the 2019 General elections. Live Updates Election Result 2018: Rajasthan, Madhya Pradesh, Telangana, Chhattisgarh, Mizoram: The Congress party on Tuesday delivered a severe blow to the BJP in the Hindi heartland of Chhattisgarh, Madhya Pradesh and Rajasthan just a few months before the Lok Sabha elections as it dethroned the saffron party with a clear-cut majority in all the three states. However, in Mizoram, Congress lost its last bastion in the north-east, giving way to the MNF while in Telangana, the TRS of K Chandrashekar Rao retained power with two-third majority. As per ECI trend at 7:30 AM on Wednesday, the Congress has bagged 113 seats and leading on 1 seat. While the BJP won 109 seats, the Samajwadi Party of Akhilesh Yadav has earned one seat and announced that the lone party MLA will support Congress. The Bahujan Samaj Party of Mayawati has won two seats. The outcome of the Assembly elections in these five states will have an immense impact on the general election slated for early next year. The good show by Congress has come as a big boost for its cadres just ahead of the Lok Sabha elections. The party will look to repeat its performance in 2019 with an aim to dislodge the BJP. Besides, the win is seen as an incentive for the Congress to project Rahul Gandhi as the leader of the proposed grand alliance in view of reservations expressed by several key opposition leaders including BSP’s Mayawati and TMC’s Mamata Banerjee. The Congress had not won any election post-2014 general elections barring Punjab. The Bahujan Samaj Party of Mayawati has won two seats but is yet to announce support for Congress. The Congress, on the other hand, has support of the lone Samajwadi Party (SP) candidate, taking its tally to 115 in 203-chair House. There are 4 independents who hold the key to government formation. In Rajasthan, Congress mulls over the top post candidature as two names are emerging for top job -- Sachin Pilot and Ashok Gehlot. While Pilot won elections from Tonk, a first time MLA, Gehlot won from Sardarpura constituency in Jodhpur. In Chhattisgarh, Tamradhwaj Sahu, Congress' lone Lok Sabha MP from the state, is said to be the front-runner in the race to become the next Chief Minister. The 69-year-old is a Lok Sabha MP from Durg and contested the Assembly polls from the same constituency. "The Congress party has emerged as the single largest party with a majority support. All the independents have in addition assured support to the Congress party," the letter said. 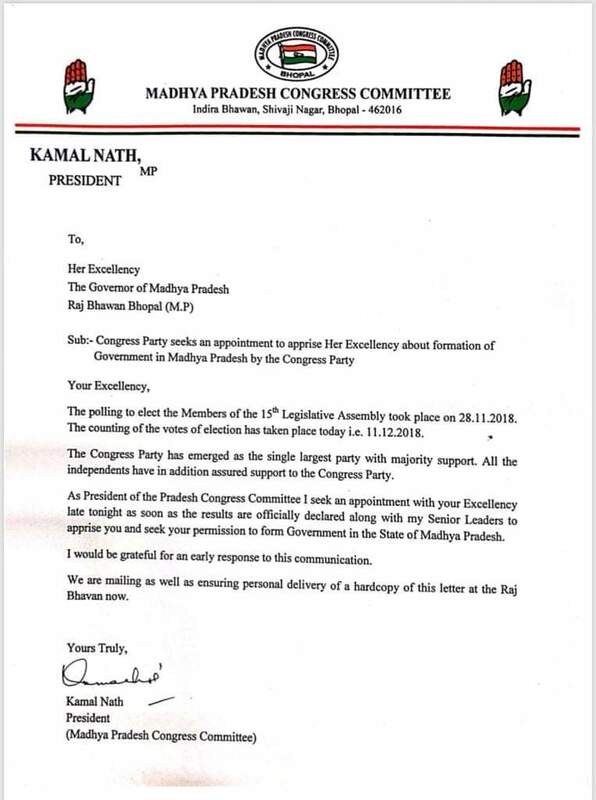 "As the president of Pradesh Congress Committee, I seek an appointment with your Excellency late tonight, as soon as the results are officially declared along with my senior leaders to apprise you and seek your permission to form government in the state of Madhya Pradesh," Nath said in the letter. An appointment will be given only after the situation is made clear by the Election Commission. Congress party will go to the Governor House and has sought an appointment late tonight with the Governor to stake their claims to form the govt in the state. The party has sought appointment by sending an email and a fax too- State Party President, Kamal Nath said. Congratulations to the Congress for their victories. Congratulations to KCR Garu for the thumping win in Telangana and to the Mizo National Front (MNF) for their impressive victory in Mizoram. We accept the people’s mandate with humility. I thank the people of Chhattisgarh, Madhya Pradesh and Rajasthan for giving us the opportunity to serve these states. The BJP Governments in these states worked tirelessly for the welfare of the people. "Issues in state elections are entirely different, we won all these states in 2003 Dec & lost the general election in 2004. Therefore these results don't reflect automatically. The 2019 elections will be around the performance of Central govt & leadership of PM Modi," ANI quotes Arun Jaitley as saying. Terming the "Congress Mukt Bharat" slogan of the BJP as "arrogance," former Prime Minister H D Deve Gowda Tuesday said the people have made the nation "arrogance-free" through their verdict in the assembly elections in five states. "The intentions of making India 'Congress-free,' 'opposition-free' shows the arrogance of BJP. The people have made this nation 'arrogance-free' by voting out BJP," Gowda said in a tweet. 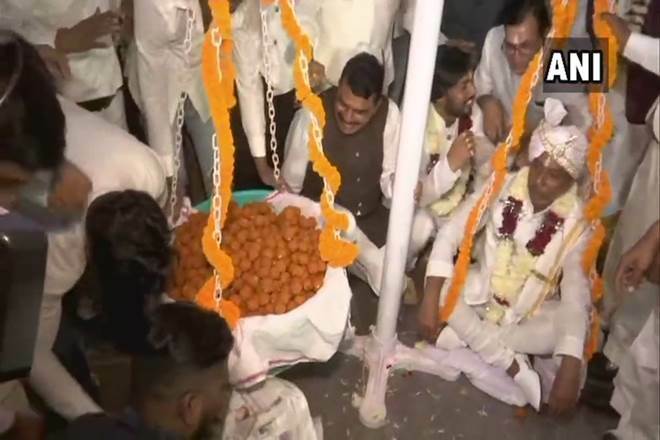 Congress distributes 'laddus' equal to the weight of Satnami sect guru Baldas, who joined the party recently. The ruling AIADMK Tuesday said the mood of the people for the Parliamentary election next year cannot be judged based on the poll outcome in the five states, while main opposition DMK lauded Congress for its good show. Senior AIADMK leader and Fisheries Minister D Jayakumar, when asked if the mood of the people would reflect in the 2019 Parliamentary polls, said the electoral scenario could change. 'The situation keeps changing,' he said ading that the mood of the people cannot be fully guaged based on the results of the five states. Chattisgarh Governor has accepted resignation of chief minister Raman Singh. In the results announced today, the Congress has won the election with clear majority. They will announce their leader in the CLP meeting. Congress appoints AK Antony and Mallikarjun Kharge as observers for Madhya Pradesh and Chhattisgarh, respectively. Don't want to erase anyone from the face of India: Rahul Rahul Gandhi. BJP has an ideology, we'll fight against it & defeat them. We have defeated them today & we will do this again in 2019. But we don't want to erase anyone from the face of India, says Rahul Gandhi. Rahul Gandhi says corruption in Rafale deal will be out. He added that PM must do something on corruption, problems of farmers, economic crisis among others. Rahul Gandhi hails Congress performances in Rajasthan, Madhya Pradesh and Chhatisgarh. Says this is victory of Congress workers. This is a victory of Congress workers, small traders, farmers. This is a big responsibility for Congress party and we will work on this. With Congress making a comeback in Chhattisgarh, Madhya Pradesh and Rajasthan, JD(S) leader former PM HD Deve Gowda said people have made this nation ‘arrogance-free by voting out BJP. "The intentions of making India ‘Congress-free' and ‘opposition-free' shows the arrogance of BJP. The people have made this nation ‘arrogance-free' by voting out BJP," he tweeted. PL Punia, Congress in charge in Chhattisgarh said that the party accepts the mandate. "They have not given us the right, they have given us a responsibility. They believed the promises we made in our manifesto. People trusted the words of Rahul Gandhi ji and gave us an agenda, we accept it," he said. Chhattisgarh CM Raman Singh said that he takes responsibility for BJP's defeat because the poll was contested under his leadership. "We will act as a strong Opposition and work for the development of the state," he said. "We respect the mandate that the public has given. I congratulate Congress on this success. I consider it my luck to serve the public of Chhattisgarh for the last 15 years." Bhupesh Baghel, Chhattisgarh Congress president said, "This is a victory of democracy. BJP had a lot of money and a team of corrupt officers, they also had conspirators in their pocket. Despite all of this, the mandate given by the people in Chhattisgarh is historic." Congress leader Kapil Saibal said, "This is the victory of Rahul Gandhi, our party, workers, people, and the fight against scams. This is the victory of humanity." Chhattisgarh's outgoing Chief Minister Raman Singh has resigned from the post. The development comes hours after Congress' superb win in this central state. Zoramthanga, President of Mizo National Front(MNF): Since I am going to form the government now, my first priorities will be three things—to impose a prohibition on liquor, repair roads & implement Social Economic Development Programme (SEDP) which is our flagship programme. He added, "We will not have any coalition govt either with BJP or any other ways because my party can form the govt on its own as we have got 26 seats out of 40. We're a part of NEDA(North-East Democratic Alliance) & NDA but we wouldn't like to join Congress or UPA." Senior Congress leaders, including Navjot Singh Sidhu and Priyanka Chaturvedi, joined the party workers at the 24, Akbar Road office and expressed joy as the trends of poll results showed Congress taking the lead in the three states. "It was a united effort in preparing and campaigning for polls. The leader at the top was inspiring everybody. Rahul ji has exhibited great character in a time of crisis, like a captain guiding a ship in choppy waters," Sidhu asid. Congress workers burst crackers, danced to the dhol and played with gulal as they celebrated the party's good show in Rajasthan, Chhattisgarh and Madhya Pradesh. Carrying the Congress flag, a large number of workers gathered at the party headquarters in Delhi and praised Rahul Gandhi's leadership in steering the Congress towards victory in the three states ruled by the BJP. They distributed sweets and put up big banners of Gandhi on the walls of the Congress office. The Congress workers chanted 'Rahul Gandhi Zindabad'. Interestingly, a Congress worker also put up a banner that said, "Next prime minister of India" for Gandhi. CPM candidate Girdhari Lal has won the Dungargarh assembly seat, defeating Mangala Ram of the Congress by a margin of 23,896 votes. The CPM is leading on the Bhadra assembly constituency as well. After drawing a blank in the last election in Rajasthan, the CPI(M) is all set to win two seats, both of which were held by the BJP. The Left party's Balwan Poonia is leading with 73,725 votes in Bhadra constituency of Hanumangarh district. His nearest rival is BJP's Sanjeev Kumar. In Shree Dungargarh constituency of Bikaner district, the CPI(M)'s Giridharilal Mahiya is leading with 72,361 votes. Congress candidate Mangalram is at the second position in this seat. In the 2013 elections, the CPI(M) or the Communist Party of India (Marxist) had failed to win any seat. It won three in 2008 elections. AIMIM leader Asaduddin Owaisi said that country needs a non-Congress and non-BJP government. "I say this with all responsibility that K Chandrasekhar Rao has all capabilities and capacities to ensure that a non-Congress government comes into existence when the next parliament election takes place. This country requires a non-Congress & a non-BJP government," he said. "After seeing K Chandrasekhar Rao from very close quarters I feel that this nation deserves a leader like him and I hope that next step he'll take will be successful and I'll stand shoulder to shoulder with him ensuring that in '19 election there's a non-Congress & non-BJP govt." Rashtriya Lok Dal (RLD) leader Jayant Chaudhary has announced that party's lone MLA in Rajasthan will support the Congress. "Respecting the mandate of the people, party president Chaudhary Ajit Singh has directed the MLA of the party to help Congress form a stable government.," he said in a statement. Telangana caretaker Chief Minister K Chandrashekhar Rao announced that he will actively participate in national politics. Whoever wins the elections, the outcome will have a major impact on national politics as it will determine the political and caste equations of the country when it goes to the polls in 2019. If the Congress wins at least two of the big states, the parties opposed to BJP-led alliance are bound to rally around the Congress and firmly establish Rahul Gandhi's acceptability among them and masses. Political expert Badri Narayan, a JNU faculty, told IANS that a win for Congress will boost and mobilise the opposition parties. “Congress will revive itself as a major political force ahead of the general elections,” he said. Collectively, these five states account for 83 Lok Sabha seats. The assembly election in the five states is the last hope for the Congress as it has never won an assembly election under Rahul Gandhi’s leadership. However, the party had managed to keep the BJP out of power in Karnataka by backing the Janata Dal (Secular) HD Kumaraswamy whose party has half number of MLAs than the Congress.